Do you want to pass the FE Exam? Yes, I want to Pass! I started this blog post 3 days ago, and today I am finally putting the finishing touches on it. I considered reworking this whole introduction to avoid being too vulnerable…but that’s not going to happen, it’s not how I roll. If you’ve been following me for any amount of time, you know I pride myself on being open, transparent, and honest with myself and others I am working with. Whether it be my family, friends, or students…you are going to know exactly what I am thinking…not just what I want you be thinking. So with that being said, I am just now getting myself out of rut that stopped me flat in my tracks. Currently, as I type this very sentence out…I am stuck. This isn’t the greatest feeling. With a family of four at home who rely on me being their to support their emotional and physical needs…this is killing me. For the students I am mentoring and guiding here at EngineerInTrainingExam.com and in our FE Exam study Program, Prepineer…being in a rut, stuck, is not the ideal situation. Most of you reading this right now are familiar with this feeling. It’s not a productive emotion…but an unfortunate one we all experience at times. Maybe you are currently stuck, in a rut, at work, preparing for the FE Exam, or at home. Or maybe you are just finding your way out, experiencing the exuberance of having a mind clear of clutter, tracking towards your goals once again. That’s a beautiful thing, and please share your experiences in the comments below, we need to hear your story, it’s powerful and inspiring. Regardless of what side of the roller coaster you are on, this is life. Every single one of you is an incredibly talented engineer, just accept that right now. You have educated yourself through a curriculum that is viewed as one of the most excruciating, with a graduation rate less than 50% here in the United States. Yet, you and I both sit there at times with a troubling level of self-doubt. Wondering how we got to the point that we are, wishing we had an ounce of courage to get ourselves unstuck and moving back in the right direction. Most of us have “day jobs,” putting in hours and hours behind a cubicle, doing things that in the long run, really don’t matter much to us. But we hold on to a hope that some day some amazing turn of events will arise to bolster our careers, our lives, to levels we have always wanted. But for many, right now, it seems like this day will never come, and we continue to sit in line exchanging our dreams for a number 2 pencil and free access to AutoCAD. Somewhere along the line we stopped growing and learning…reaching for the stars…those days seem lost. But the truth is, they aren’t lost. We haven’t lost the ability to learn. We haven’t lost the ability to grow. We certainly haven’t lost the ability to reach for the stars. We’ve just buried them deep inside, creating a misalignment in our life that doesn’t resonate with what we were put here to do. It’s time to break out of this rut, get unstuck, and realign our mind, body, and soul once again. Actively pursuing alignment isn’t binary, it’s a must do activity…taking intentional action towards moving forward isn’t an option. If it was, then, what’s left? A world of highly talented individuals left on life support. But that isn’t us, that’s not our destiny. Here are 7 key things I’ve done personally in the last three days to get unstuck. This isn’t another crappy list of half hearted advice, we will get philosophical, we will get tactical…but at the end of it all, we will get thinking clearly once again. From the very second that we enter this world we are terrified. Naturally, we shy away from doing things we don’t see others doing. We avoid putting ourselves in to positions that we don’t feel comfortable in, or rather, assume we wouldn’t be comfortable in. We define our limits within. Whether they are real or not, they become very real, and very tangible to us. They are the fence holding us back from living a life fully lived. But what we have to realize is that when we are feeling discouraged, these fences become brick walls, which manifest themselves even further in to concrete reinforced barriers. We tell ourselves that doing anything to test these barriers is sure to lead to failure…or is it? Let’s pretend for a moment, that we are able to test these barriers without the fear of it pushing us back even deeper…let’s switch it up. Today, lean in to your fears. Are you fearing going in to your bosses office and asking them a tough question? Are you fearing opening up your FE review manual and not getting traction? Are you fearing [FILL IN THE BLANK]? Whatever it is you are fearing today, I want you to lean in to it. Accept it for what it is, and push through it anyways. And you will realize one thing…what you are fearing, what you see as barrier, doesn’t even exist. It’s just a projected image you have put out there to hold you in a “safe zone”. But a safe zone isn’t safe forever…the monotony leads us to being stuck in a rut. Fear can protect you, yes, but it can also paralyze you from taking any action in line with what you were put here to do. But here’s the good news…fear takes a back seat to action, and action is a choice. When we were kids, our imaginations knew no limits. We wanted to do big things, make big impacts, and change the World. This was my story, and I’m confident this is your story too. Then we got in to the corporate world, and suddenly we found ourselves living by other people’s agendas. Our dreams and aspirations became second fiddle to what others wanted us to do or say. Where did we go wrong? When did we trade in our dreams for “corporate security”? This isn’t a bust on the corporate world, it’s a bust on us not staying true to ourselves. Let’s be honest, when we are in a rut, it’s even harder for us to believe in ourselves and live out the legacy we once dreamt. Our creativity, will and drive are diminished…on fumes. We need to flip that, and start thinking big again. Meditate on that answer and be real with yourself…are you doing everything you can do to be the best you can be? The answer is most likely not. When you realize where you are putting your focus, it helps begin the process of detangling your thoughts, ushering you back in to alignment with your true inner desires…clearing a pathway for courageous, unfiltered action against the resistance that has made itself a home between you and your ultimate purpose. 3. Make sense of your story. When we are in a rut, its common to look outwards for answers. Looking within at our story, at our journey, is the last thing we want to do, because frankly, at this moment we don’t have much faith in ourselves or our abilities. But looking at our story is exactly what we need to do. Our story is the most powerful thing that we have. It’s what makes us unique. It’s what makes us strong. It’s what makes us who we are. If we turn our backs against our story, we become the ultimate pawn in the world’s ongoing chess match. We become part of the herd, the sheep, creating a reality where our story really doesn’t matter, that we need to rely on others to get us to where we want to go. This is not true. We are not pawns…we are Kings and Queens of an amazing story that has unfolded over the last 20, 30, 40 years. In this moment, we need to slow down, and be OK with that. We need to reflect on where we have come from, the challenges we have faced, and the results of our actions. We need to recognize just how Blessed we are, and that where we are today is the result of our amazing story. Accept your story, every part of it, the good, the bad…it is what makes you a conduit for change in a world that needs exactly that. When we are rutted out, stuck, the last thing our mind allows us to consider is how we can help someone else in need. Our negative thoughts have driven us so low that a thought of driving a positive action in to this world is quickly muddied up by a 1000 other negative thoughts. But think about it, have you ever walked away from helping someone feeling worse? The act of helping is an act equivalent to leaning against the resistance. The mind provides you resistance, you lean in to it, you conquer it, and you come out better because of it. Acting in this manner gives you perspective on your situation and gives you confidence that no matter how low you feel, that your help, your support, your being, is still mightily important to the other people that are out there. People everywhere need our help, and I believe this is by design, so that we don’t crawl back under our covers and dwell on our own personal situation. Instead, the hurt that surrounds us affords us an opportunity to reach out and help others, and regain perspective in our won lives. A perspective which illustrates what really is reality, that in our pain, almost every other individual out there is struggling in some way or another. And if we can just see that our pain is just a part of the collective pain of human suffering, we can realize that at the very least we have each other and are in it together. 5. Fall Back on the Fundamentals. When life is stripped down to its bare essentials, you are left with your habits. Whether you are aware of it or not, habits drive our lives more than we can ever understand. The Habit Loop, as Charles Duhigg defines it in his remarkable read “The Power of Habit”, can work miracles in your life. Understanding what drives you and how it’s driving you is paramount in gaining the control and momentum you seek in your personal life. Stripping life all the way back to our habits is crucial to getting ourselves headed back in the right direction. For me, mornings start with meditation, reading, reflecting, exercise, and the sauna…which leads in to a dose of Bulletproof Coffee, talking with friends, and daily planning. This is all done with near zero effort. My mind doesn’t have to make decisions, because I have created a Habit Loop to do that for me. This means I don’t have to rely on my Will Power to get going, a resource that is near depleted when we are in a rut. When my mind is cloudy, stuck, dark, the last thing I need to be doing is making decisions, or trying to force myself forward. I revert to my fundamental routines to do this…and that’s what you need to do. I know its easier said then done. When I am stuck, the last thing I want to do is wake up when it’s pitch dark outside. When I am stuck, the last thing I want to do is sit down and meditate…that just seems torturous. When I am stuck, the last thing I want to do is go and put myself through a torturous workout. Our fundamental routines may seem like the last things we need to be doing to get unstuck, but it’s actually the opposite…these fundamentals are exactly what we need to be doing. We get out of a rut because we focus on the fundamentals, the building blocks that lift us up and make us stronger. Period. “A body in motion tends to stay in motion…” rings as true today as it did in the 1687 edition of Principia Mathematica. 6. Trust Yourself to Fail. You need to fail more. A strong statement, yes, but what initially came to mind when you read it? The mindset of failure is huge when it comes to getting unstuck. Most of us have been brought up to believe that failure is permanent and that we need to hedge risk as we move through life. Unfortunately, this way of thinking is a primary reason why we stopped dreaming big in the first place…dreams are thought to be risky, and open us up to the chance of failing. When we are stuck, we tend to roll back in to this belief system, we shy away from risk because it could set us back even more. But we have to do just the opposite…we have to trust ourselves, take risks, and fail. Failing isn’t permanent, it’s an opportunity to learn and grow. When we are learning and growing, it’s impossible to feel stuck because we are reinventing ourselves by the minute. When we are reinventing, we see light, an opportunity, and because of that we are energized. Get out and fail and fail fast. I’ve touched on the importance of Quick Wins while you study for the FE Exam. In the same sense, Quick Wins are just as important in getting unstuck. When we are stuck, everything we try to do looks gargantuan. No matter what the task is, we are quickly overwhelmed, “June Gloom” fills our minds, and we lose sight of where we are going. There is a simple solution to that…take the first step, a micro step…get your Quick Win. Lean on that Quick Win to push you in to the next Quick Win, until eventually, quicker than you may think, you will have established sustainable momentum moving forward. Start small, very small, and commit to that first step, then worry about the next step after that…but only think about one step at a time. Let go of being perfect. Let go of what you feel is the external bombardment of expectations…expectations which may or may not be real. Be prepared to come up short, but have confidence in the process, and keep pushing…it’s all part of the process. When you are 100% committed to seeing it through, it doesn’t matter if you stumble along the way. All that matters is that you know you will get there. So be persistent, stay determined, and fight the good fight…because this too shall pass. A Powerful thought that has rang true as I sit here in Starbucks wrapping up this post. It’s been three days since I started, and it hasn’t been easy to gather my thoughts and get them out on paper. But I’ve leaned in hard, pursued perspective, and meditated on the legacy that I’m creating in a story that is still unfolding. I stripped away the weight of life and resorted to my fundamental building blocks, trusting myself that movement forward more important than perfection and the key to getting back up and running. I was committed, and am committed, and know that a discouraged heart will try to make itself at home once again. But I am Ok with that, because this is life…and we are all in it together. If you are in a rut, keep pushing forward. Be intentional in your actions, and this too will pass. Whether it’s at work or in your FE Exam studies, stay committed to seeing the process through. It’s easy to fight and push ourselves down even lower, especially when you have high expectations. However, its just as easy to flip that switch and pull yourself back up. 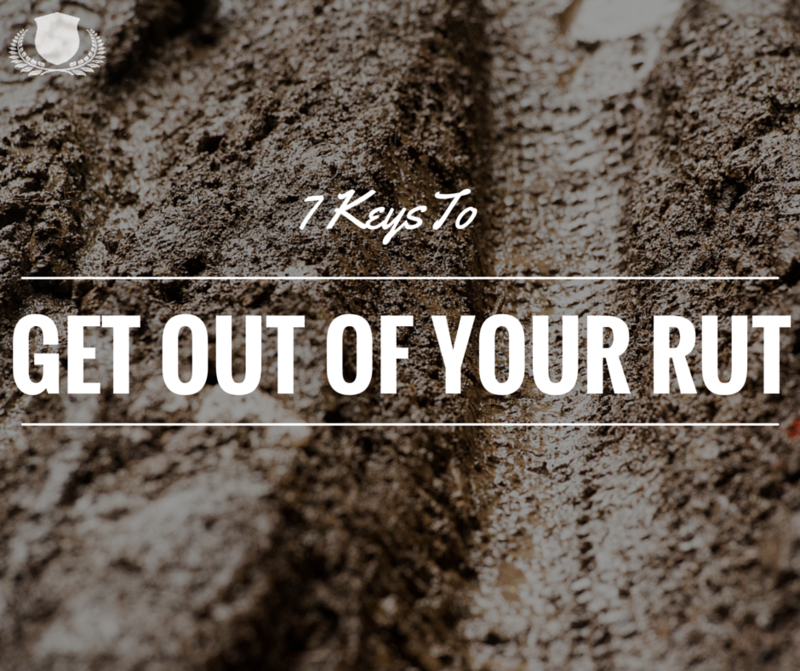 What’s something you do to get yourself out of a rut? Leave your comment below. If you found this post helpful, please pass it along to your closest colleagues, clients and friends — anyone you think could use a little extra support as they work towards their dreams in life. They may need to hear these words at this exact moment. See you in the comments below! One suggestion/request, please make the whole syllabus into small packages according to number of questions, so we have a framework and we can put a date on it that I have to complete uptill the date we plan, so we are not over extending it, and wasting time, because to me its now or never. Tajdar, hey man, great to hear from you! Can you expand a little on your comment? When you say “make the whole syllabus into small packages according to number of questions” what exactly would that look like? I cannot agree more with the above post. One of the takeaways was coming back to the fundamentals that make us who we are today, regardless of the [any] current rut we may be facing. I truly appreciate your insight, Justin. You got it my friend. Thanks for your comment, stripping life down to the fundamentals was/is crucial, like you said, to keep a grip on the reality of the noise around us.